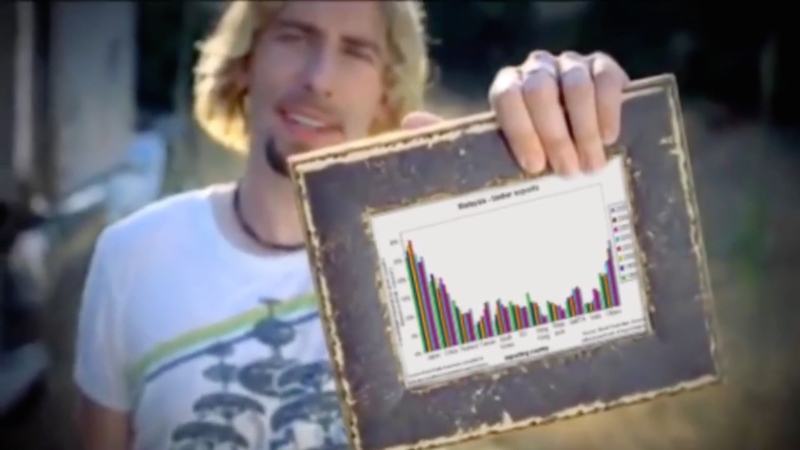 We’re as surprised as you are, but, somehow, Nickelback have managed to beat out bands like Foo Fighters, Linkin Park, Seether and Avenged Sevenfold in a new study which has analysed the lyrical intelligence of popular songs. This may be the scientific event which the Nickelstats meme (below) foretold. Through an investigation titled, ‘Lyric Intelligence In Popular Music: A Ten Year Analysis’, analyst Andrew Powell-Morse reckons he’s proved that the words within popular songs are getting dumber, and that in the popular rock world, Nickelback aren’t actually the worst offenders when it comes to “dumb” lyrics. The Canadian rockers, who many people love to hate, took out first place in the rock category of the study, with the longest and most sophisticated lyrics of the groups analysed. Linkin Park came in second, followed by Seether and Foo Fighters. That said, all of these bands’ most popular songs include lyrics which, Powell-Morse says, are at a third grade level. Yikes. In the pop music category, Mariah Carey sits on top with lyrics of a fourth grade level, followed by Adele and Justin Timberlake. Unfortunately, Ke$ha’s lyrics are still at a first grade level, so she might have to repeat a year or two and, maybe, learn how to spell too. Powell-Morse’s study used the Readability Score system to create averages of the US reading level for different pieces of text. In this case, they were lyrics from 225 songs which had spent at least three weeks at #1 on the Billboard pop, country, rock or R&B/hip-hop charts. View some of the study’s graphs below, and if you’re brave enough to face the harsh realities of modern popular music, read the whole thing over at the Seat Smart website.